Last updated March 2019 - yes, we still meet every week! The Bristol Unicycle Hockey club re-launched in October 2006 after a break of several years. Our new team name is The Severn Wheelers. We now meet weekly and have about a dozen members. We usually play on Wednesday evenings at the St. Pauls Sports Academy in central Bristol. We usually play from 8.30pm - 9.30pm. Please contact us to check the time we are playing that week before travelling a long distance! The cost is £7 for full price and £4 for concessions (unwaged or in full time education), which covers the costs of hiring the venue. NB. Under 16s must be accompanied by a parent or guardian. We play as safely as we can, and injuries are very infrequent, but all sport has a certain amount of risk. We're just a group of friends who meet to play hockey and share the expense of hiring the hall, so we ask all players to make their own assessment of risk to themselves - and under 16s would need a parent/guardian to make that decision. The St. Paul's Sports Academy is on Newfoundland Road, which runs parallel to Newfoundland Street / Newfoundland Way (the road that leads into the M32). It has its own car park. 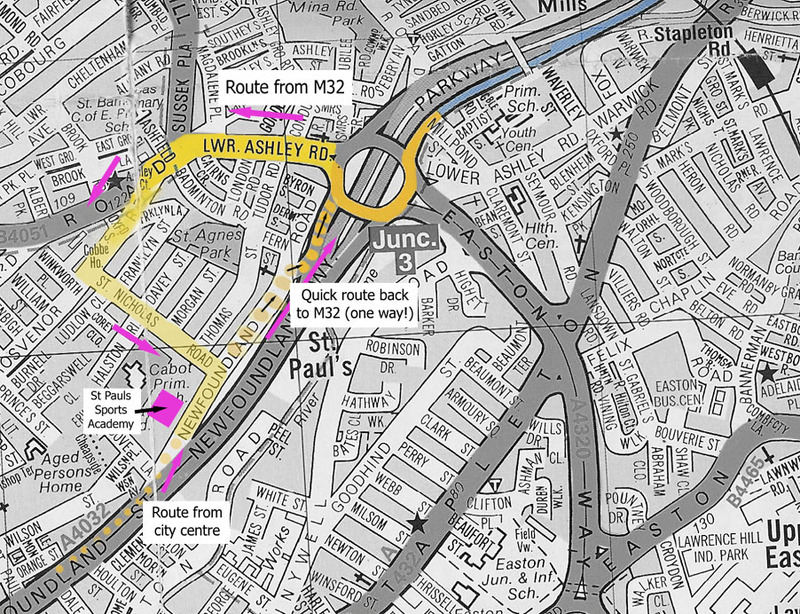 Drive up Newfoundland Street as if going to the M32. Bear left on Newfoundland Road and the Sports Academy is on your left. See map. Drive into Bristol on the M32. Leave the motorway at Junction 3, and at the roundabout turn right onto Lower Ashley Road. At the traffic lights turn left onto Ashley Road. After a very short distance turn left onto Grosvenor Road (narrow one-way road just before the small park). At the end of the one-way section turn left onto St. Nicholas Road. At the end turn right onto Newfoundland Road. The Sports Academy is on your right. See map. Newfoundland Road is one-way at each end. To leave we suggest turning left onto Newfoundland Road, carry straight along Newfoundland Road, then bear right onto the slip-road. This will take you to the M32 Junction 3 roundabout. From here you can join the M32 north or go around the roundabout to go south into the city centre. See map. Click here to open in a larger window. We also now have a Facebook group.